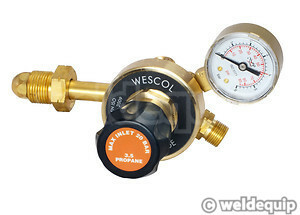 Premium quality British made Propane gas regulator. Specially fitted with an output pressure gauge for increased accuracy when setting working pressures. Solid brass construction with industry standard 5/8”BSP left hand gas cylinder connection and 3/8”BSP left hand hose connection. Not suitable for use with Acetylene gas.